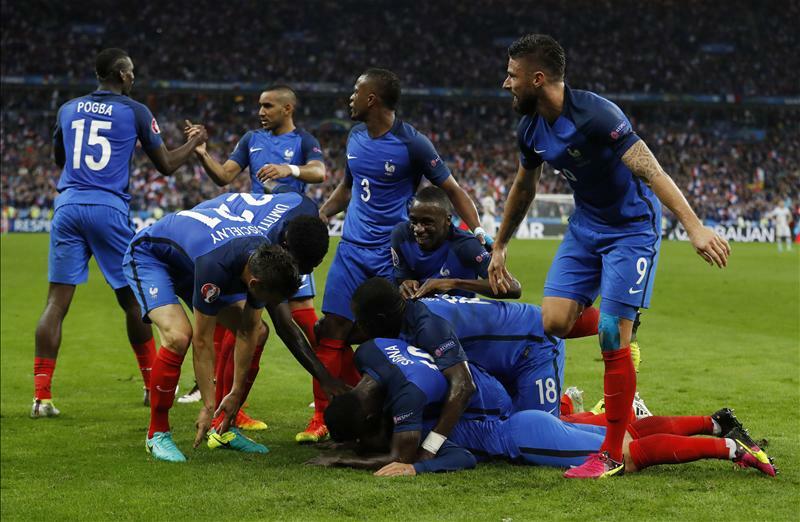 France sent Iceland's improbable dream crashing to an end as they crushed them with a five-goal hauling at the Stade de France, moving on to the semi-finals of Euro 2016. A dominant first half from the tournament hosts saw Giroud, Pogba, Payet and Griezmann find the target in emphatic fashion. There was something to cheer about when Iceland found a goal early and late in the second half, but sandwiched between that was Giroud's second goal which put the writing on the wall. Saint-Denis was a cauldron of anticipation as the Icelandic minnows stepped into the lions' den that is the Stade de France. Registering the first shot on target with a tame effort from Gylfi Sigurdsson, they weren't afraid to counter the flamboyant passing moves of the hosts which saw Payet easily saved early on. As the early stages progressed, momentum shifted towards France's favour as they had more of the ball. It would all be snapped up when Olivier Giroud raced through on goal after a ball slotted down the left, where he swept it through the legs of the keeper at the near post. With that, the French made a flying start. Other than an Iceland throw-in which was adequately dealt with by the more than prepped defence, as Umtiti shook off the cobwebs on his debut, France were unscathed en route to doubling their lead minutes later. An inch-perfect corner whipped in by Griezmann was met by a thumping header as Paul Pogba rose above his competitors to knock it in. With their fans still at full voice, the natively named "Strákarnir okkar" were down but not disheartened. They would have made it a contest had Bödvarsson been able to convert his razor close chance, with a throw-in being headed in his direction where he tried to poke it in at full stretch. The underdogs continued to aggressively press, but to no avail, because soon enough - after Matuidi's volley and Lloris' jitters - things would get wrapped up in style. In the final minutes of the half, Giroud headed a cross back out to the box where Griezmann teed up Payet. The West Ham engima then rolled it on to his left foot, creating plenty of space in the process to unleash a rifling effort into the far corner. 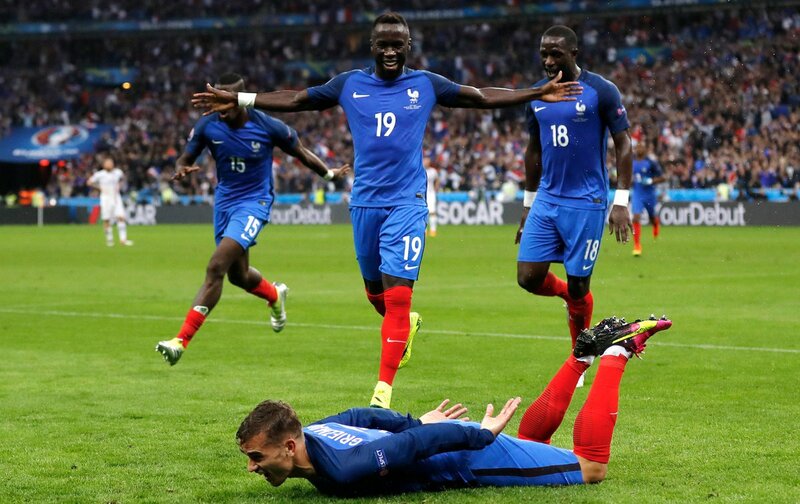 That wouldn't end the barrage though, as Griezmann added insult to injury before half time. A pass from the back was flicked on behind by Giroud to send Griezmann through on goal and past the back-four, where he surged into the box, bided his time and then chipped it over the keeper. France were flying high and had their semi-final place all secured even with 45 minutes left to play. There was no let up when the second half began, either, as Payet had a go from far out but couldn't cleanly hit the ball. However, it was Iceland who netted first in that period, giving something for their fans to celebrate about as Kolbeinn Sigthórsson found the back of the net. Sigurdsson crossed from the right where he was waiting to sneak it at the near post. It wouldn't be the start of a comeback though. Olivier Giroud made the inevitable all the more inevitable when normal business was resumed from a fine header. Dimitri Payet's free-kick curled menacingly into the box, where he directed it past the keeper to give France the highest tally in an individual game at the tournament. But still, as rain poured in Saint-Denis, Iceland's heart was on full display. They chased down each and every ball, eventually forcing Lloris to make a spectacular reflex save as he thwarted a point-blank header. Soon, the fans would be singing again, as Bjarnason knocked in a header from close range to double Iceland's tally. A late Griezmann chance fizzled out while Mangala cleared away a dangerous ball prior to the sounding of the full-time whistle, where France's comfortable victory was confirmed, with everyone in the stadium proud, following the Icelandic courage and the French class. The minnows' journey comes to an end, but France will meet Germany in the semi-finals.